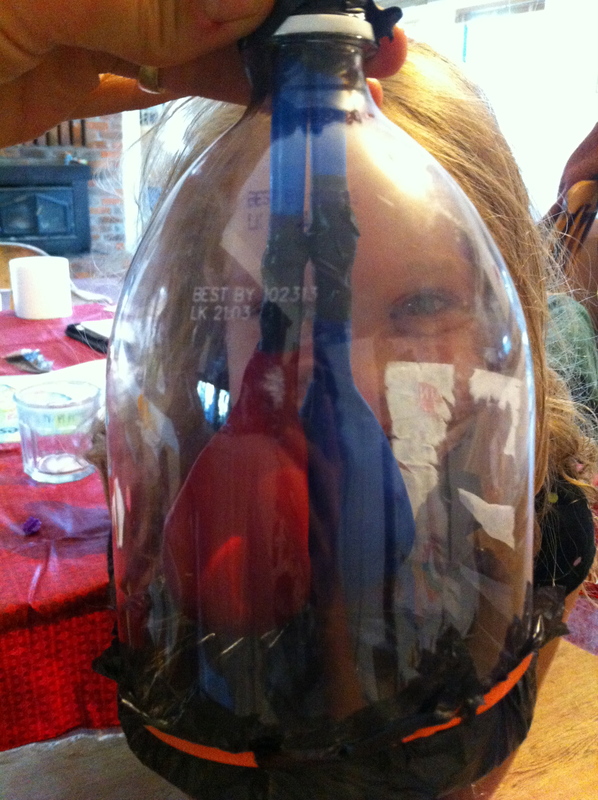 Make a Lung Model out of a Plastic Bottle, Straws & Balloons! It’s funny how this thing has become a toy to her. 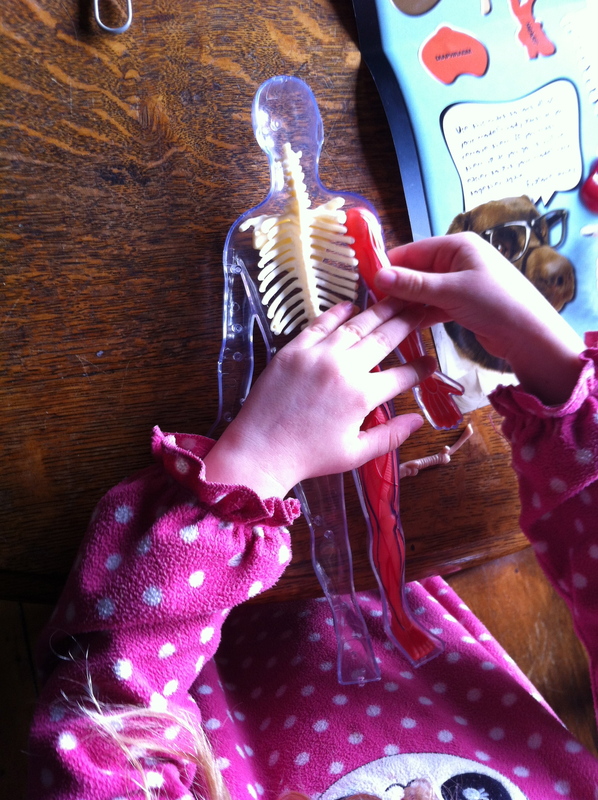 This morning she was in her room explaining the respiratory system to Scooby Doo and the Gang! It’s anatomy time, and the human body unit is in full swing at The Cabin. 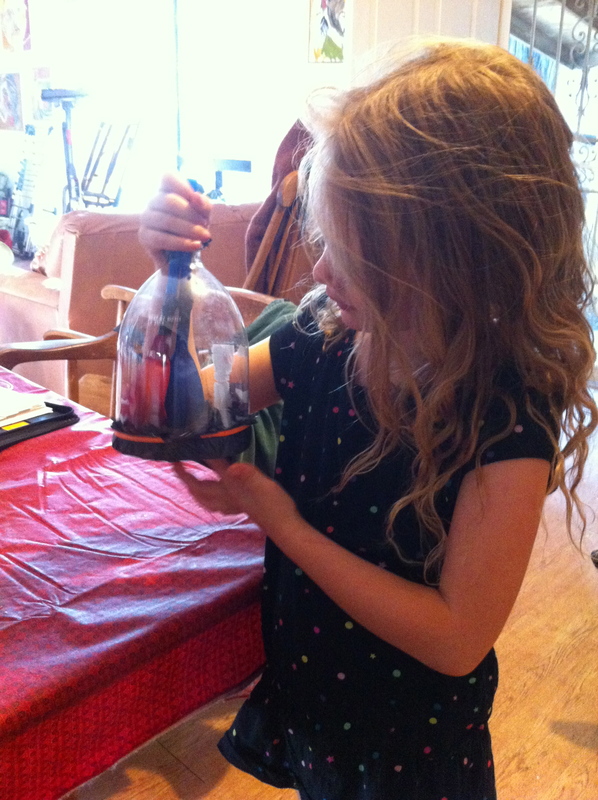 In learning about the respiratory system, we created a simple lung model that has been a hit in our household. I doubt Captain will ever forget how this system works! You’ll Need: A plastic 2 liter bottle cut in half, two straws, two balloons, masking tape (or black electrical tape as that is what we had around and it worked great!) a rubber band and a piece of plastic bag. Step 1: Put a straw down into a balloon, almost to the bottom. Securely tape the top of the balloon to the straw so that it is air tight. Go around with the tape a few times to be sure it is sealed. Do the same to the second balloon and then secure the two straws together with more tape. Step 2: Put the straws down into the bottle top and tape around and around the rest of the bottle-opening to be sure that it is air-tight. If air gets in, the model won’t work. Step 3: Place the bottle onto a piece of plastic bag and use a rubber band to secure it tight to the bottom. Trim off the excess bag, if needed. Step 4: It is helpful to tape a little piece of paper, or a string, to the bottom of the diaphragm to pull it up and down. You take about 20,000 breaths a day and sneeze at about 100 miles per hour! Lungs weigh about 1 pound each and adult lungs are each about the size of a football! Your right lung has 3 regions, or lobes, while your left lung has two lobes and each lobe has its own blood supply. That way, if one part is damaged, the other 4 keep working! How cool is that? One more note: It is very beneficial to have kids draw a picture of what they learned, coloring the balloons, straws, etc. Help them label the simple parts. The human body is amazing! Happy breathing into all of those lovely lobes! 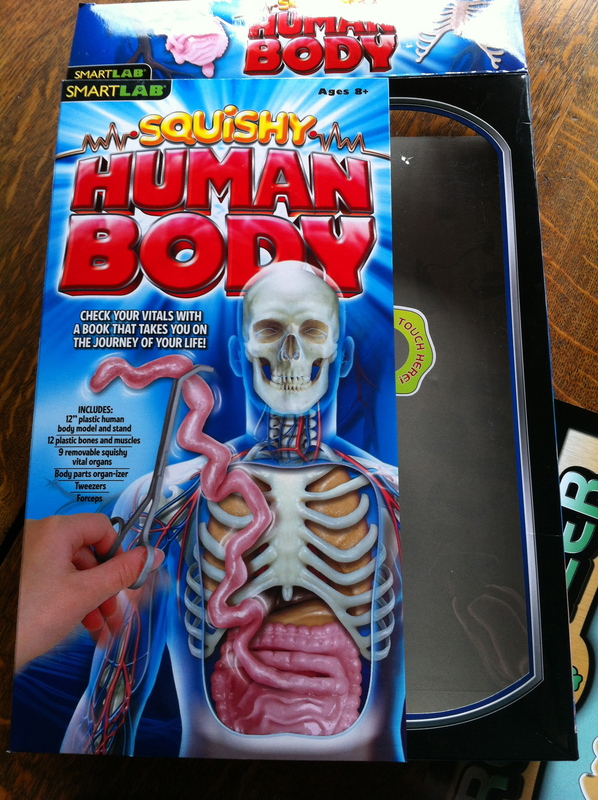 Great Human Anatomy Manipulative: The Squishy Human Body is Fun! 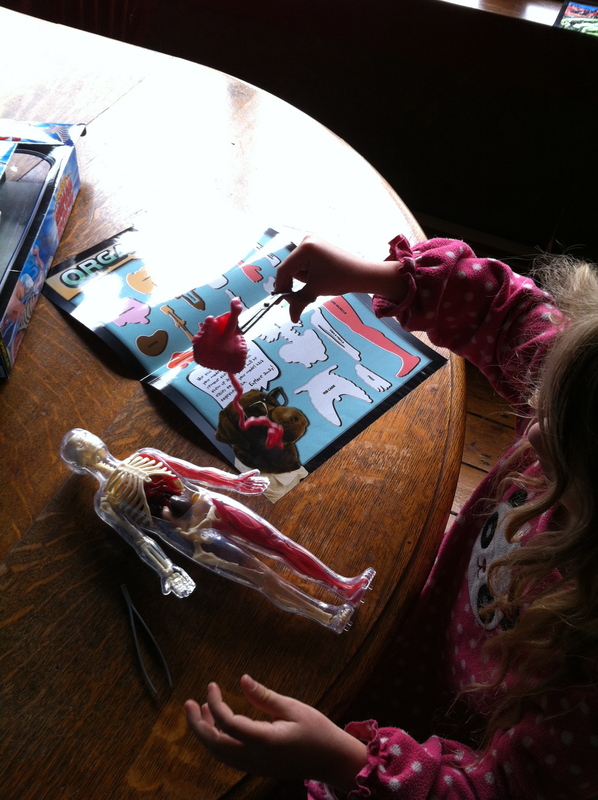 My daughter is 5 years old and loves human anatomy almost as much as dog anatomy. 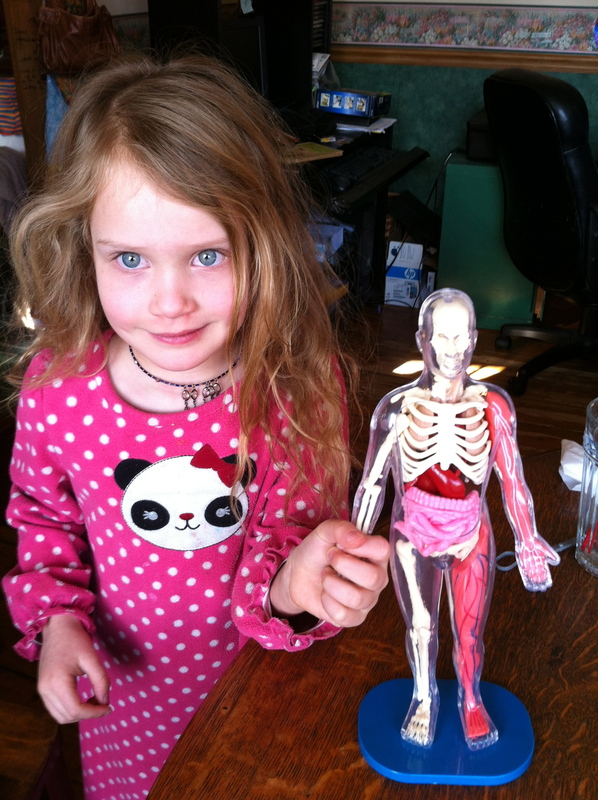 Today I gave her a present that I had stashed away, and I wanted to share it with y’all because we found it to be very cool for kids who are learning about human anatomy. It is a Squishy Human Body, made by SmartLab. It sells for 21 bucks on Amazon (free shipping) and is well worth the price. 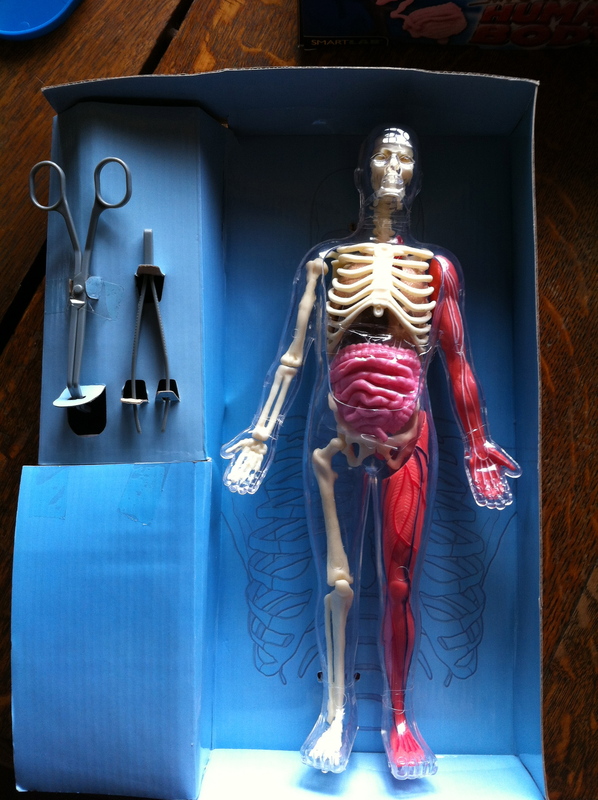 The manufacturer lists this 12″ plastic human body for ages 8+ but, as always, it depends on the kid. 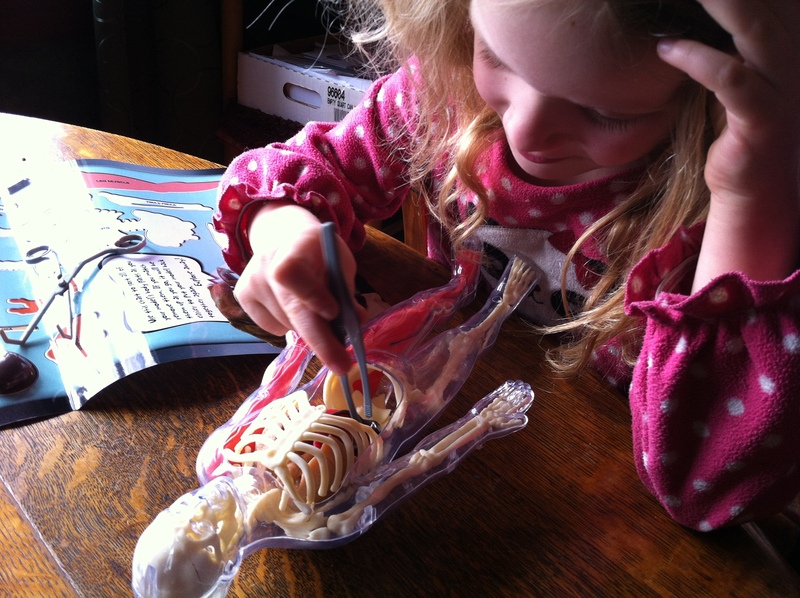 The bones, muscles and organs are encased in a clear plastic form and the set comes with plastic tweezers and forceps. There is also a body-parts “organ-izer” included, which is basically a poster that names each of the parts. After removing a bone or organ etc. 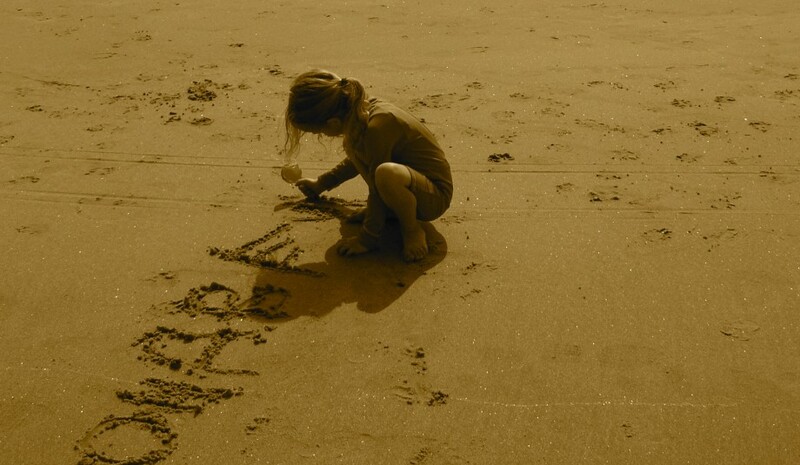 the child then places them on the poster and learns the name of it. An adult, or older person, should work with them on this project, to help them identify the parts, and also to assist in putting them back together. 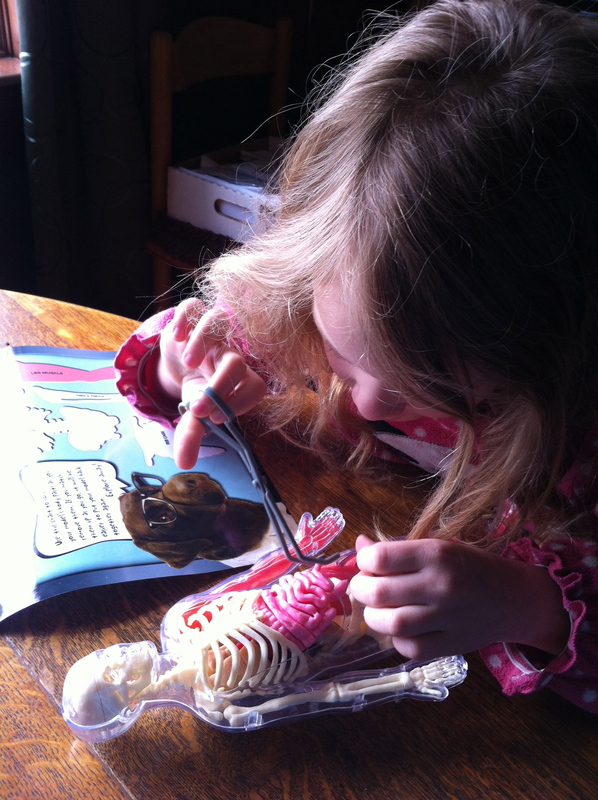 It isn’t easy for little ones to replace the parts in the correct places, and snap the bones together without help. I think it won’t be long before she can do this on her own. 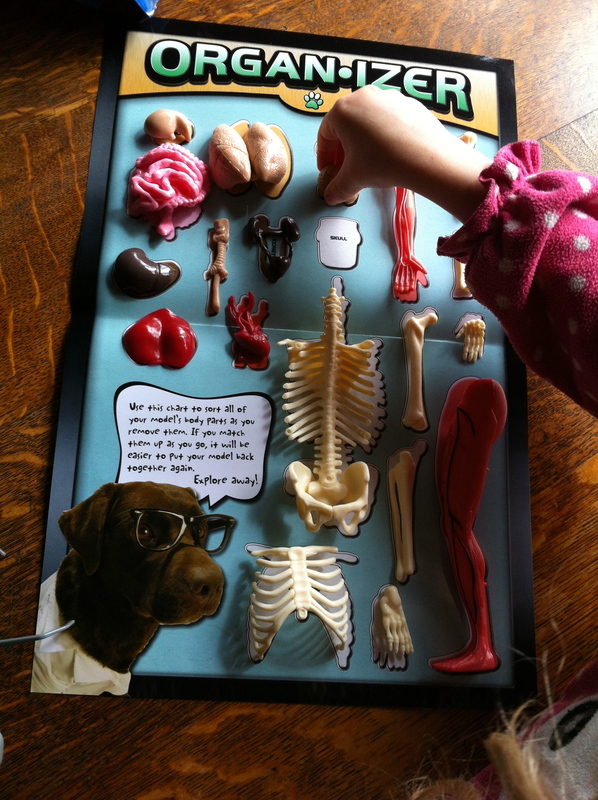 The set also includes: 12 plastic bones and muscles, 9 squishy vital organs and a stand for displaying your cool body. Here’s the extra fun part: the squishy organs are really squishy and ooh-ey! We couldn’t stop exclaiming “ooh gross!” and “squish-squish-squish!” It was fun! Before reassembling it, Captain had fun stuffing other organs into the skull and generally just playing around with it. While she extracted and placed organs on the poster, I told her a few high points of each organ. For example, she learned that the liver is a kind of filter for the body, that the intestines are reaalllly long if you uncoiled them for real, and reminded her that the human heart has 4 chambers. The particles of knowledge really sink in easily when a kid is having a tactile experience that is enjoyable, like an ooh-ey, squishy heart! 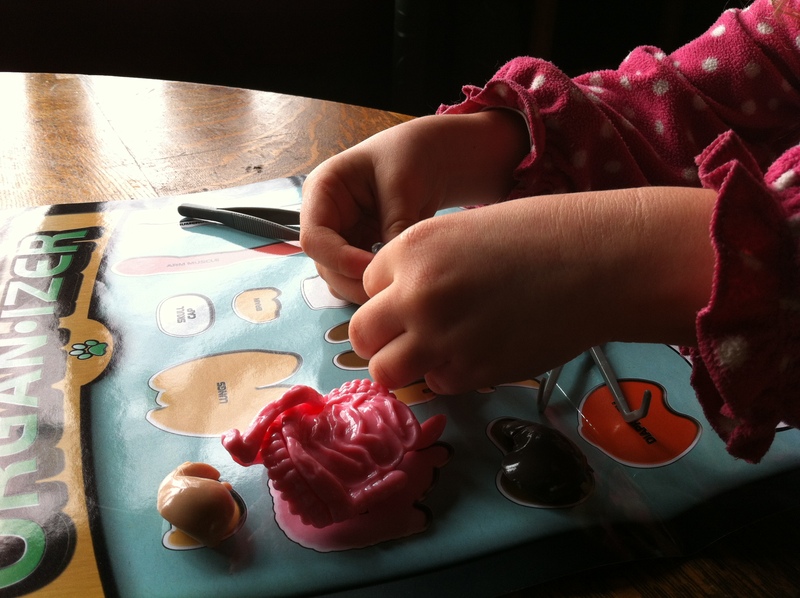 Next on the wish list is the squishy human heart, brain and we need to get our hands on an eye…. I can’t wait!